It’s hard to believe, but 2019 marks the 25th year of TECHNE. We have so much to be grateful for and so many exciting things to look forward to in the future. Over the next several months we will be sharing TECHNE history, including an interview with our founder, projects that shaped the office, commentary from TECHNE alum, and inside stories from our current team as we approach our anniversary on August 15th. (FUN FACT: Three former employees share the same birthday with the office’s anniversary. What are the chances?) 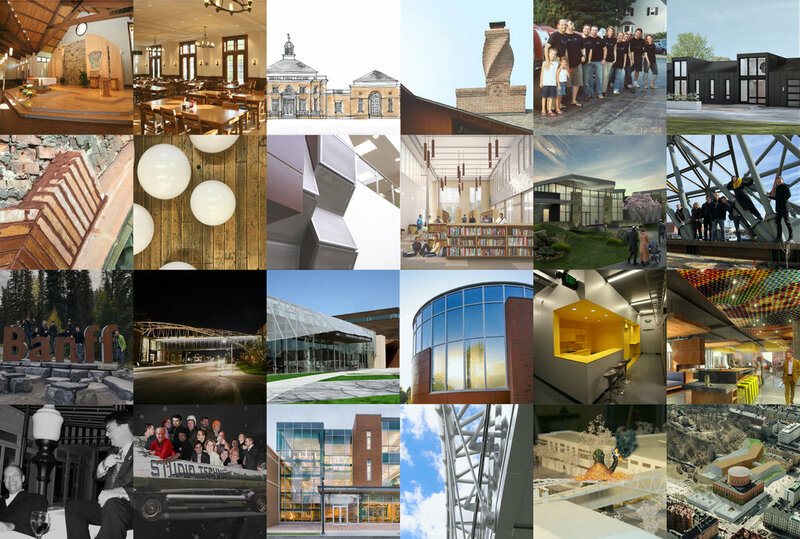 For now, we hope you enjoy a few photos of our last 25 years. Hawken School approached us somewhat timidly with a need - “We would like to make a place of innovation where students will explore complex ill defined problems and engage in non-sequential iterative processes to solve essential questions” - a perfectly terrifying start to a Monday. Fortunately, we have been working for the last ten years with a variety of clients implementing places of innovation that allow students to develop skills in brainstorming, exploration, critical thinking and collaboration. The opportunity for students to define a problem, organize a solution, prototype, test, fail and repeat are critical 21st century skills and develops resilience and leads to true innovation. Similar challenges were encountered by our design team—the space the client had in mind was an underutilized 1930’s era brick walled gymnasium. Our team met with educators and students in a series of discussions and sketch exercises to develop a set of design criteria focused on designing a learning environment that would engage students and foster a culture of playful but rigorous problem solving. The main activities required were a place to prototype, a place to collaborate, and a place for the students to present their ideas - definitely more program than the gym was able to support. 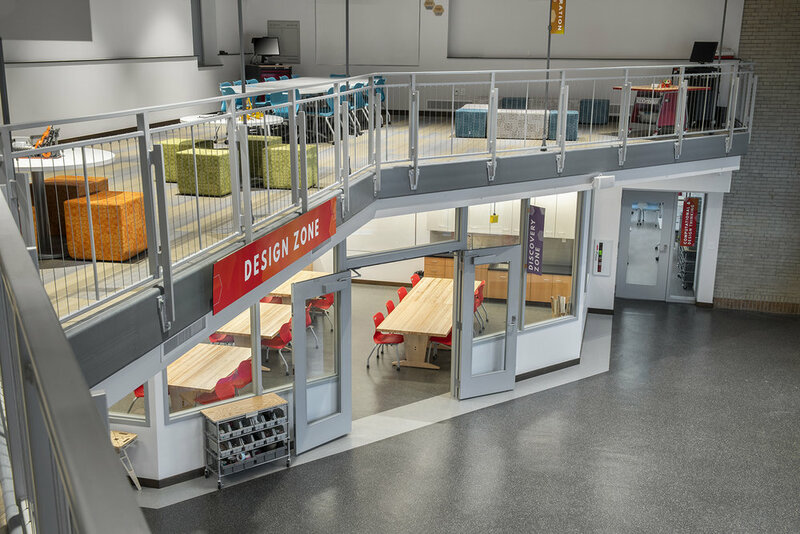 The design team utilized the height of the gym, adding a mezzanine to create the collaboration and ideation area overlooking the fabrication and making equipment. 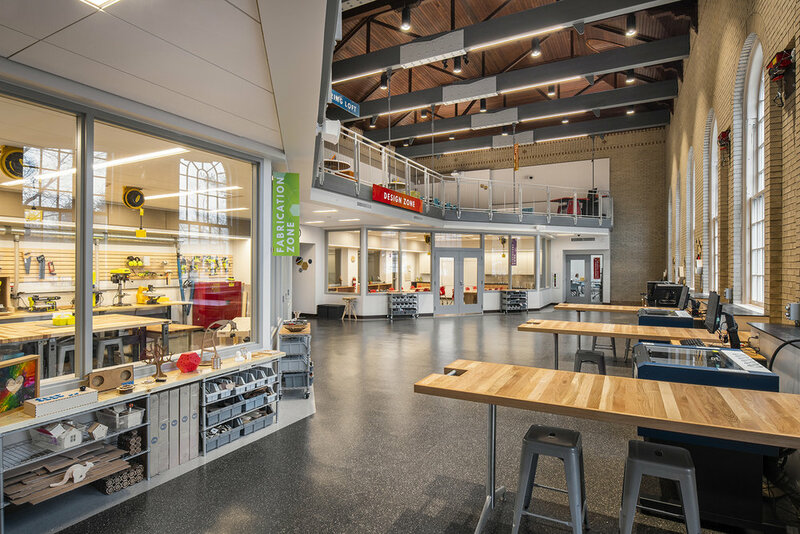 studioTECHNE supported school leadership in the development of the project through open communication, developing inspirational drawings and images of the space that effectively conveyed the schools vision to their donors and the school community. The completed Innovation Lab met the curriculum + educational goals of the school, and students are excitedly engaged in hands-on learning and making. On a recent trip to Seoul, South Korea I couldn’t help but frame my experience in the fast-moving metropolis through the lens of someone accustomed to life in a comparatively calm Midwestern city. With more than 13x the population of Northeast Ohio, Seoul suffers from near-constant gridlock but benefits from a vibrance and, with it, the commensurate resources Cleveland hasn’t seen for nearly 100 years. 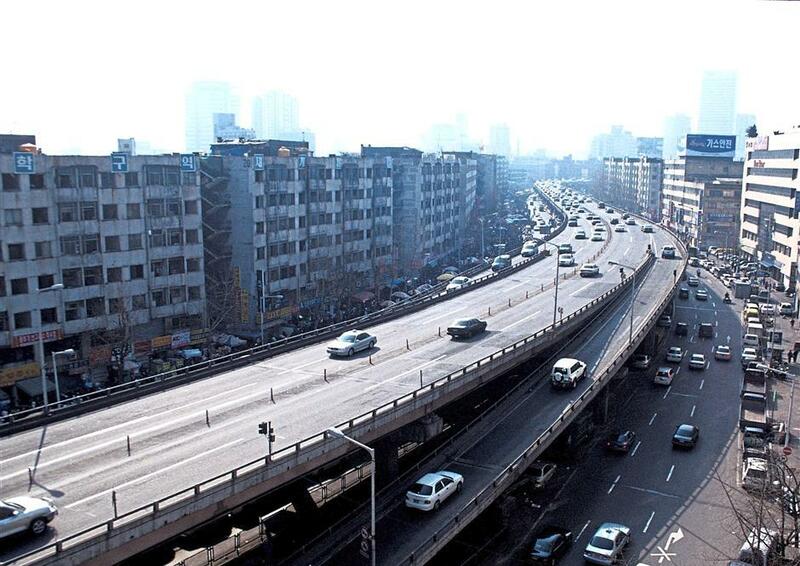 Like Cleveland, Seoul experienced rapid industrialization, urbanization, and subsequent suburbanization. As the city sprawled after the Korean War, so too did its infrastructure. Over a mere decade, urban and industrial infrastructure was choking the last vestiges of nature out of the core of the city- particularly in the dense and flat CBD. Hoping to spur economic growth by providing new recreation options to residents and solve the city’s chronic runoff problems, officials decided to do something bold. They made the controversial decision to remove a massive arterial highway and replace it with a long, meandering park and stormwater mitigation system. After 3 and a half years of work, Cheonggyecheon, has become one of the most popular green spaces in the city. One would be hard-pressed to identify the location of the idyllic watershed in photographs from just 15 years ago when the stream was culverted by a double-decker 8 lane expressway. What was once chocked from sunlight by layers of concrete infrastructure is now a healthy watershed replete with dragonflies, pelicans, and innumerable native plant species (marking an increase in overall biodiversity of 639%) and teeming with schools of fish. While the park is only 7 miles long and 50’ wide, the economic, social, and ecological impact on the city has been astronomical. Summer temperatures around the perimeter of the park dropped 11 degrees and particulate air pollution by 35%. With more than 64,000 daily visitors- thousands of which are out of town or foreign- the surrounding owner-occupied buildings along the banks of the stream have found newfound success and increased economic stability thanks to the throngs of visitors. Like Cleveland’s own public square, Cheonggyecheon is a perfect example of how re-evaluating public spaces and civic infrastructure can be fundamental to remaking a city. Similarly ambitious projects are in the works along Lake Erie, but I couldn’t help but think of the hundreds of culverted watersheds and highway-bisected neighborhoods that dot Northeast Ohio. What transformative potential could projects like this-big and small- hold for Cleveland? What would happen if we continued to re-evaluate our public infrastructure? And what kind of agency do we have as citizen-designers to push Cleveland towards a more sustainable, healthy future? Engaging, appropriate, modifiable lighting is a critical component in creating successful spaces. The fascinating thing is that so few people are aware of the power of lighting. Lighting temperature is measured in degrees of Kelvin. In this case the word temperature is describing the color emitted by a light source. Imagine a candle flame and the range of colors from the wick to the tip of the flame. The color varies based on the differing temperatures across the flame. Incandescent bulbs radiate light energy and our current LED technology attempts to recreate that appearance. The important thing is matching the chosen light temperature to the activity and mood of the space being designed. This is true for every type of space. 2700k is warm and cozy, approaching the color of candle light in feeling - this is where Danish hygge happens. 2700 and even the next step higher is the best for occupants’ skin tones and improves the mood of almost any space. 3500k is a bit cooler while still feeling in the ‘warm’ range, there’s still a tinge of yellow to the light. It’s acceptable, we’ll leave it at that. 4100K is starting to be crisper, a bit bluer even a little green. This can be described as more neutral but you’re reading the writing of people who think it’s fair to call it cold. 5000K is, in theory, simulating a bright sunny day. Let’s not even start. 6000K is called full sunlight. No. Just, no, not ever. When you’re driving, and you see a breathtaking scene, one that makes you pull over and stop. Do you wonder what it is that resonates within you? Is it the overlap of shadows? The subtle shifting colors? The structure of the trees or the rise of a hill? As architects and designers, these are a few of the thousands of questions we ask ourselves as we work. If only it stopped there. This incessant analysis bleeds into every object, surface and environment we encounter in our daily lives. You can’t imagine the discussion that goes into buying a glass – how does it feel in your hand? Is it too heavy? Too squat? Too round? Not round enough? Is it just serving a purpose? Or enhancing your life? A blessing? Or the ‘Curse of Design’? This compulsion requires us to continually seek answers to those questions through a rigorous critique of color, finish, composition, quality, feel, and function. How did we get here? Is this nature or nurture? Born cursed? Or cursed by education? As a 7-year-old I wrote in my diary “someday I will be an architect”. Was this genetic? Or too many Brady Bunch reruns? Whatever innate personality traits we have are focused and refined by an education process that at best can politely be referred to as rigorous and often crosses the line into obsessive. Don’t get me wrong, while a curse, it provides for a highly curated life; an amazing experience of well-designed and presented clothing, accessories, home décor, vehicles and even food. We have a deep appreciation of the effort it takes to design an object well, and the moment of wonder and surprise felt at finding something special among the expected. Good design is not a luxury. Good design balances the inherently functional with a sense of beauty. It is something that enhances your life and brings you joy. While we certainly wouldn’t wish our curse upon anyone, we do hope this will ignite a bit of inquiry the next time you hold a glass or smile as you pick up an object or feel content in a space you regularly frequent. Unlike our fictionalized counterparts, the average architect does not earn an exorbitant salary. We do, however, appreciate [and covet] beautiful objects and good design. Cost is always a problem; we’ve invested some time and here’s our work around. Buy it in black. Paint it in black. Chose the black one. High gloss, matte black, sometimes something in between. Bottom line: Black. Architects, really designers in general, know that there are many ways to manipulate the eye. Color, pattern, and proportion can make you think something is larger, smaller, and better than it really is. In an effort to evaluate the true form of the object, the authentic nature of the thing, the thingness of the thing if you’ll pardon some Heidegger, take away the trappings and look at it in black. Your favorite architect will own black t-shirts, black cars, black notebooks, black dishes, certainly black framed eyeglasses, black bags, and infinite black pens. Now don’t go too far. Actually, do - because it’s mega cool: consider Vantablack. This chemical substance made of vertically aligned carbon nanotube arrays prevents you from determining contours, edges, and form. We digress… and as per usual, into very expensive territory. Bringing the conversation back to what is attainable for mere mortals, there is an even better reason to choose to live in a monochromatic world: things look more expensive in black. Black smooths out the disparity between expensive and inexpensive. In a world where you can’t afford everything you’d like to own, spend your money wisely. Choose black. Some need direct light for 6+ hours, others thrive in indirect light. Take note of lighting available in your space. If you have access to southern windows, succulents and cacti would be a good choice. If your main source of light is a light fixture from above, you can’t go wrong with ferns or low light plants like pothos. 2. Who Will Maintain the Plant? Without even a little maintenance, all plants will die. Whether it’s a personal plant, office plant, or an entire living wall, determine who is responsible for their care. Ensure they’re getting the water they need and are tended to if bugs or mold arises. For the low-maintenance lovers, try the best low maintenance plant – Snake Plant. Succulents are marketed as low maintenance, easy-care plants, but have a lot of demands to be able to thrive indoors. This includes bright, direct sunlight, and not over watering. If you see your plant dramatically stretching, don’t be fooled – it’s not growing quickly, it needs more sunlight. It’s attempting to stretch towards the sun. For watering – water your plant at the base. The amount of water varies per plant/pot. If you have a drainage hole, water plant thoroughly until water runs out of the bottom for about 2 seconds. If there is no drainage, only water with about a tablespoon. For both, watering every other week is plenty. 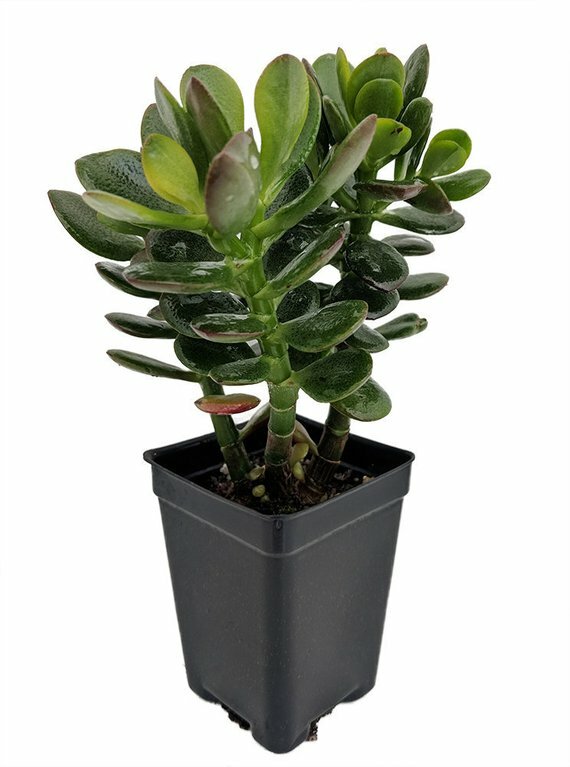 Forgiving Succulents include: Jade Plant or Echeveria Firestorm. Will any one be bothered by the type of plant you’ve chosen to adorn your space with? This is especially true for plants that are producing pollen or have fragrance, or pets that could get sick from eating the plant. Some people may have allergies to your selected plant, or don’t share the same affinity for plants. Check with your neighbor and see what plants could work for you both. Plants, in general, are incredibly resilient. You can do them wrong and they will forgive you time and time again. If you have a plant that isn’t responding to its current environment in the way that you’d like, try adjusting the location, watering schedule, humidity and draft exposure. No matter the situation, there’s a plant for everyone and every space. Following the recommendations in this guide will make sure your plants thrive. Now, where do I get one of those “Plant Lady” shirts?